Great Smoky Mountains National Park is the most visited park in the system, hosting more than 9 million visitors a year. Unlike most national parks, entry to the park is free. Its surrounding communities depend heavily on the park, which is the lynchpin of the region’s tourism economy. Named for the prevalence of fog, which appears to rise as if from smoke stacks when viewed at a distance, the park is one of the rainiest habitats in the United States, racking up more yearly precipitation anywhere in the country outside of the Pacific Northwest and Alaska. That fact, combined with its steep elevation gradients, make for an abundance of waterfalls. 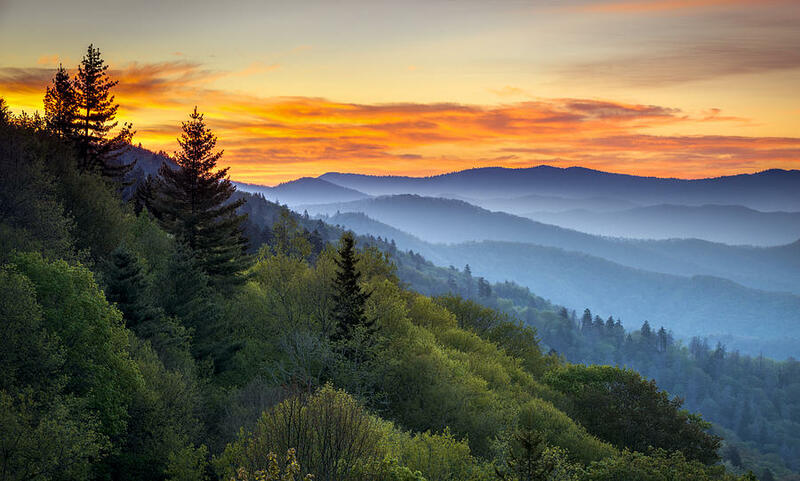 The park’s ample rainfall and dense deciduous forestation — particularly at lower elevations — mean that Great Smoky Mountains National Park is also an excellent destination for fall foliage viewing. About 36 percent of the park is covered in old growth forest that predates European settlement of North America. Click to see a detailed Great Smoky Mountains National Park map.